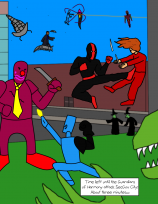 This unfortunately unnamed beekeeper comes from a comic called Nailbiter. I will be trying to avoid spoilers, in case people reading it stumble upon this site through a search engine or whatever, but here’s what you need to know: there is a small town called Buckaroo that has produced a higher number of serial killers than any other place, and certainly more than would be expected from such a small place. Obviously, people get curious. One of the protagonists of the book is an FBI agent whose investigation leads today’s beekeeper. Actually, he first meets the beekeeper’s grandson Roger, who runs the honey farm in his grandfather’s stead. Gramps is too busy being contained in the basement, because Roger seems to think he would be dangerous to the world at large. From what we see, Gramps mostly spends his time just dissecting bees. 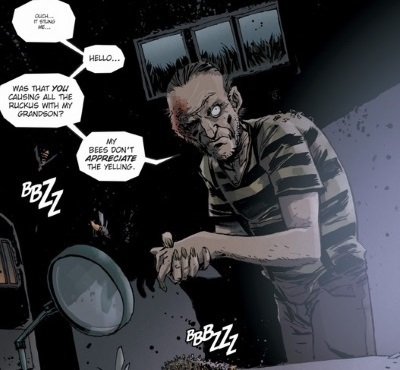 Whether the cause of the serial killers is supernatural is part of the comic’s mystery, but as in so many cases, I am here to argue that the beekeeper, at least, absolutely has supernatural powers. Let’s get to it. First of all, there is near constant rain in Buckaroo, and the bees don’t mind at all. That’s cool. That’s a start. Is he immune to bee stings? Not really. He says he is “for some reason invulnerable to their many stings. It hurts and I blister, but I… do not die.” I mean, that’s something, but not enough to really build my case upon. He makes a comment that suggests he could smell bee pheromones, which is better. But perhaps the biggest sign of preternatural power is actually present in his biggest downfall: the Beekeeper Rage. When he flips out on the investigator, his bees attack for him, which suggests a connection. He specifically says that he delights in watching his bees attack the intruder, and he barely notices that his grandson is collateral damage in that attack. There is no doubt that this guy suffers from the Rage. But in spite of that, he is not one of the town’s serial killers. He is in on the secrets of the town (and may have even been involved long ago), but instead of givin’ in to the killin’, he notes that he has only killed once, when he was young and stupid. What’s more, he has used his time as a crazy basement person studying bees because he believes he can learn from them to save the town and improve humanity. It is almost as if he saw the evil the world could offer and directed his Rage toward trying to change it. That’d be a good thing if he were better at it, but at least he tried. At least he resisted that allure of serial killing. Anyway, neither he nor his grandson survive the story. 3 Honeycombs out of Five. For posterity, Roger, who is a more normal beekeeper would rate a 2. It is mentioned that honey farming used to be a big industry in Buckaroo until about twenty years before the story. If that is when Roger took over, it’s a sign that he’s not supernatural enough to have kept things going.